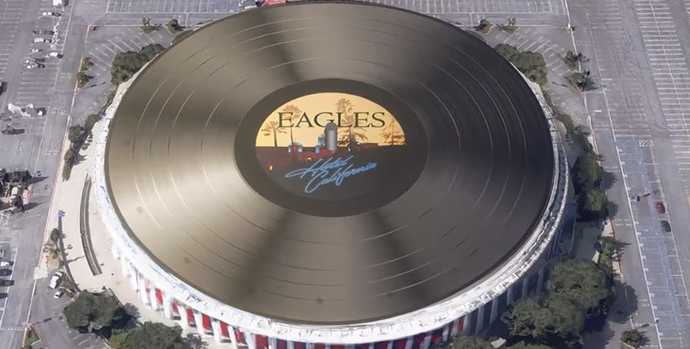 The Eagles lost out on being our Most Evil Musicians of All Time, but here’s something that might change the vote: they just made a 75-member crew work through the Christmas holiday building a 407-foot vinyl replica of their “Hotel California” record. Well, to be fair, the band didn’t really force the crew into anything. Madison Square Garden Company purchased Inglewood, CA’s iconic Forum in 2012, and they booked The Eagles for a six-night stint to rechristen the venue. The 4,884-inch record was constructed to sit atop the newly renovated landmark arena to coincide with the shows, and it will remain there through the first week of February. Covering 5.6 acres — the equivalent of 4.5 football fields — the record actually spins at 17 MPH. Passengers on airplanes arriving at LAX should be able to spot the spinning “disc” thanks to lettering as large as the Hollywood sign and some 15,000 LED lights. Thankfully, the construction crew couldn’t figure out how to fabricate a 10-foot tall record needle. But to see how they made the world’s largest vinyl record, watch the promo clip below.